Chord Company debuts new Sarum T cable range | What Hi-Fi? For the first time, the company's Taylon technology is incorporated into more 'affordable' products, although prices start at £1800. 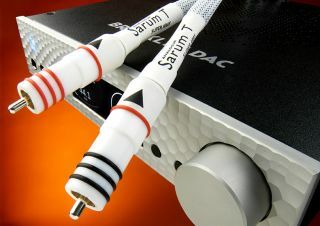 Chord Company has launched the Sarum T range of analogue and digital cables. Comprising a mains power cable, analogue interconnect with RCA, XLR or DIN terminations, digital interconnect (S/PDIF, AES/EBU or BNC) and speaker cable with banana or spade connections, the range uses Chord's proprietary Taylon insulation material in a drive for a major performance upgrade over the company's existing Sarum range. Until now, Taylon has been reserved for use in Chord's flagship ChordMusic range. Sarum T brings the technology down into a more affordable range of products. Of course, 'affordable' is a relative term. The Sarum T range starts at £1800 for a 1.5m pair of speaker cables, while the audio interconnects (both analogue and digital) start at £2100 per metre. So the system you're joining together had better be something special.